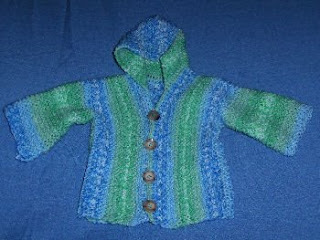 Bev's Country Cottage Blog: Finally- new sweater pattern!! I have it done and hope it all works well for everyone - the numbers and counts drove me crazy. It is a side-to-side sweater for babies 3-6 months and it has a hood! I made it in lightweight baby yarn so it would be a fun beach sweater with a light weight hood to cover and protect from the sun. You could make it in heavier worsted weight yarn for a colder weather sweater. These would be wonderful for humanitarian causes worldwide. Be sure to check with your local women's shelters and see if they can use them. I hope someone will try it out and let me know if the numbers are right and work out for you. That is absolutetly beautiful, and precious, and sweet and cute and adorable, did I say AMAZING???? I so Love your creations bev, ther're always breathtaking. Thank you, Bev. I have been trying to make sweaters for children to give to my best girlfriend who will be home in Sept ...she's a missionary teacher in Thailand. Hugs, Louise in eastern Wa. That is a great pattern - unfortunately it is knitting, which I can't do. How about a version for crochet? Or perhaps the measurements so we can adapt it? I bet with cotton yarn it'd make a nice bath or pool towel to wrap baby up in. That's lovely. You used the self-striping yarn, right? I've got some of that, but I've never been able to get it to stripe up properly. I can knit, but like Sandie I'd appreciate a crocheted version. Just wanted to drop you a line to tell you I love your site and have used made many of the patterns as gifts for people I love. Thank you so much for putting together this collection. That is a lovely sweater. I must print out that pattern to let my mum try it (she is really the knitter in the family not me!) I do enjoy reading your blog and visiting Bev's Country Cottage for patterns, information and ideas! Thank You for sharing so much! Wow, what a wonderful pattern. I think that this one would be great for the homeless and battered women's shelters. Can you possibly post instructions for larger sizes (including adults)? Thanks for all the compliments about my sweater pattern. I wish I had the time to come up with larger patterns, or a crocheted version, but it took me 4 years to come up with this one! LOL! Nah- really, I simply don't have enough time to do all I would like to do with knitting and such. I work 4 part time jobs now to help pay bills and my knitting time is really limited. What time I do have is used to make small items that can be finished quickly for humanitarian, so that more people can be warmed. 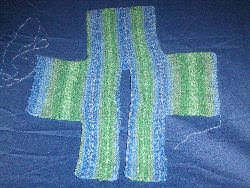 If I do come up with an alternative for this pattern it will be a crocheted version in the same size. 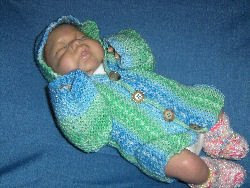 To make it slightly larger- like toddler sized, try using worsted weight yarn and larger knitting needles, perhaps a 10.5? Thanks Bev, for responding so quickly. I will make this pattern as is, because it is a wonderful pattern. And I think that I speak for many when I say that we truly appreciate all that you do to get the patterns out there for charity. It is a very hard time for many right now, and lots of people need all of the help that we can give to them. You certainly go above and beyond in your giving. May God richly bless you. Have a wonderful day!